If you listen to Ben Bernanke, Barack Obama and the mainstream media long enough, and if you didn’t know any better, you might be tempted to think that the economic crisis is long gone and that we are in the midst of a burgeoning economic recovery. Unfortunately, the truth is that the economic crisis is far from over. In 2010, more homes were repossessed than ever before, more Americans were on food stamps than ever before and a smaller percentage of American men had jobs than ever before. The reality is that the United States is an economic basket case and all of these natural disasters certainly are not helping things. The Federal Reserve has been printing gigantic piles of money and the U.S. government has been borrowing and spending cash at a dizzying pace in an all-out effort to stabilize things. They have succeeded for the moment, but our long-term economic problems are worse then ever. We are still in the middle of a full-blown economic crisis and things are about to get even worse. If you know someone that is foolish enough to believe that the economic crisis is over and that our economic problems are behind us, just ask that person the following questions…. #1 During the 23 months of the “Obama recovery”, an average of about 23,000 jobs a month have been created. It takes somewhere in the neighborhood of 150,000 jobs a month just to keep up with population growth. So shouldn’t we hold off a bit before we declare the economic crisis to be over? #2 During the “recession”, somewhere between 6.3 million and 7.5 million jobs were lost. During the “Obama recovery”, approximately 535,000 jobs have been added. When will the rest of the jobs finally come back? #3 Of the 535,000 jobs that have been created during the “Obama recovery”, only about 35,000 of them are permanent full-time jobs. Today, “low income jobs” account for 41 percent of all jobs in the United States. If our economy is recovering, then why can’t it produce large numbers of good jobs that will enable people to provide for their families? #4 Agricultural commodities have been absolutely soaring this decade. The combined price of cotton, wheat, gasoline and hogs is now more than 3 times higher than it was back in 2002. So how in the world can the Federal Reserve claim that inflation has been at minimal levels all this time? 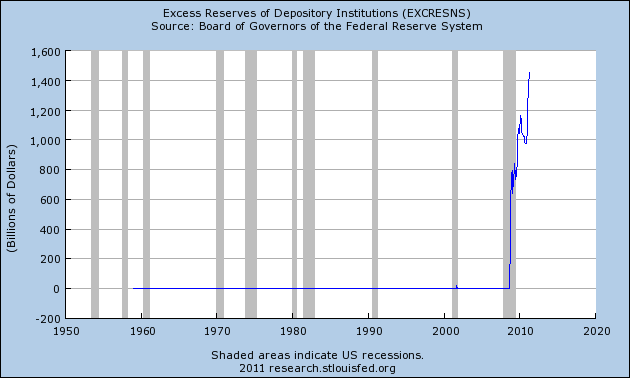 #5 Back in 2008, banks had a total of 27 billion dollars in excess reserves at the Fed. Today, banks have a total of approximately 1.5 trillion dollars in excess reserves at the Fed. So what is going to happen when all of this money eventually hits the economy?…. #6 If the U.S. economy is recovering, then why are shipments by U.S. factories still substantially below 2008 levels? #7 Why are imports of goods from overseas growing much more rapidly than shipments of goods from U.S. factories? #8 According to Zillow, the average price of a home in the U.S. is about 8 percent lower than it was a year ago and that it continues to fall about 1 percent a month. During the first quarter of 2011, home values declined at the fastest rate since late 2008. So can we really talk about a “recovery” when the real estate crisis continues to get worse? #9 According to a shocking new survey, 54 percent of Americans believe that a housing recovery is “unlikely” until at least 2014. So how is the housing industry supposed to improve if so many people are convinced that it will not? #10 The latest GDP numbers out of Japan are a complete and total disaster. During the first quarter GDP declined by a stunning 3.7 percent. Of course I have been saying for months that the Japanese economy is collapsing, but most mainstream economists were absolutely stunned by the latest figures. So will the rest of the world be able to avoid slipping into a recession as well? #11 Next week, Republicans in the House of Representatives are going to allow a vote on raising the debt ceiling. Everyone knows that this is an opportunity for Republican lawmakers to “look tough” to their constituents (the vast majority of which do not want the debt ceiling raised). Everyone also knows that eventually the Republicans are almost certainly going to cave on the debt ceiling after minimal concessions by the Democrats. The truth is that neither “establishment Republicans” nor “establishment Democrats” are actually serious about significantly cutting government debt. So why do we need all of this political theater? 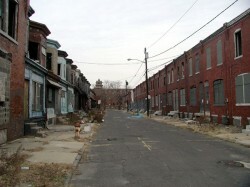 #12 Why are so many of our once great manufacturing cities being transformed into hellholes? In the city of Detroit today, there are over 33,000 abandoned houses, 70 schools are being permanently closed down, the mayor wants to bulldoze one-fourth of the city and you can literally buy a house for one dollar in the worst areas. #13 According to one new survey, about half of all Baby Boomers fear that when they retire they are going to end up living in poverty. So who is going to take care of them all when the money runs out? #14 According to the U.S. Bureau of Labor Statistics, an average of about 5 million Americans were being hired every single month during 2006. Today, an average of about 3.5 million Americans are being hired every single month. So why are our politicians talking about “economic recovery” instead of “the collapse of the economy” when hiring remains about 50 percent below normal? #15 Since August, 2 million more Americans have left the labor force. But the entire period from August to today was supposed to have been a time of economic growth and recovery. So why are so many Americans giving up on looking for a job? #16 According to Gallup, 41 percent of Americans believed that the economy was “getting better” at this time last year. Today, that number is at just 27 percent. Are Americans losing faith in the U.S. economy? #17 According to the U.S. Census, the number of children living in poverty has gone up by about 2 million in just the past 2 years, and one out of every four American children is currently on food stamps. During this same time period, Barack Obama and Ben Bernanke have told us over and over that the U.S. economy has been getting better. So what is the truth? #18 America has become absolutely addicted to government money. 59 percent of all Americans now receive money from the federal government in one form or another. U.S. households are now receiving more income from the U.S. government than they are paying to the government in taxes. Americans hate having their taxes raised and they hate having their government benefits cut. So is there any hope that this will ever be turned around before disaster strikes? #19 The combined debt of the major GSEs (Fannie Mae, Freddie Mac and Sallie Mae) has increased from 3.2 trillion in 2008 to 6.4 trillion in 2011. How in the world is the U.S. government going to be able to afford to guarantee all of that debt on top of everything else? #20 If the U.S. national debt (more than 14 trillion dollars) was reduced to a stack of 5 dollar bills, it would reach three quarters of the way to the moon. The U.S. government borrows about 168 million dollars every single hour. If Bill Gates gave every penny of his fortune to the U.S. government, it would only cover the U.S. budget deficit for 15 days. So how in the world can our politicians tell us that everything is going to be okay?